Americans love ice cream. History tells us that at the end of the 19th century ice cream was firmly entrenched in American society and with its popularity came many new inventions. One invention was the ice cream cone which made its debut at the 1904 St. Louis World's Fair. Then in the 1920s we had the first chocolate-covered ice cream bar (Eskimo Pie), the banana split, ice cream cakes, the first chocolate covered ice cream bar on a stick (the Good Humor Ice Cream Sucker), and the ice cream sandwich. John Mariani in his excellent 'The Dictionary of American Food and Drink' tells us that the first ice cream sandwiches were made with cake-like chocolate cookies. Of course, variations followed and with that came ice cream sandwiches made with oatmeal cookies and then in the 1980s the 'Chipwich' which, as the name implies, were made with chocolate chip cookies. This recipe for ice cream sandwiches are like the original in that we are combining chocolate cake with ice cream. 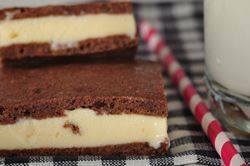 In the past I have always used these chocolate cookies but then I found, and adapted, this recipe for Ice Cream Sandwiches from Everyday Food Fresh Flavor Fast that uses a chocolate sheet cake. The important thing to watch for in this recipe is not to overbake the cake. If it's over baked it tends to crack so check this cake a few minutes before the end of the stated baking time. It makes eight ice cream sandwiches that really do taste like the ones you buy. I like how the chocolate cake stays nice and soft even when frozen. Of course, homemade ice cream is very good in these sandwiches but any flavor of good quality store bought ice cream can be used. Another great thing about this recipe is that you can make the ice cream sandwiches up to a week ahead, which is perfect as a make ahead dessert when entertaining. Ice Cream Sandwiches: Preheat oven to 350 degrees F (180 degrees C). Line a 10 x 15 inch (25 x 38 cm) rimmed baking sheet with foil and then lightly butter the foil. In a large bowl, whisk together the melted butter and sugar. Whisk in the egg and vanilla extract. Add the flour, cocoa powder, and salt and stir until combined and smooth. Spread the batter evenly into the prepared pan, smoothing the top. Bake for about 8 minutes, or until the cake is just dry, but still soft to the touch and the edges just begin to pull away from the sides of the pan. Remove from oven and place on a wire rack to cool. Then, using the edges of the foil, gently lift the cake out of the pan and place on a cutting board. With a sharp knife, cut the cake in half crosswise. Place one half of the cake, top side down onto a baking sheet that has been lined with plastic wrap. Spread with your softened ice cream, smoothing the top with an offset spatula or back of a spoon. Top with the remaining half of cake, top side up. Wrap tightly in the plastic wrap and place into the freezer until firm, about 2-4 hours or even overnight. When ready to serve, remove the dessert from the freezer, unwrap, and with a knife cut into eight rectangles. You can serve the ice cream sandwiches right away or wrap each sandwich in plastic wrap and place back into the freezer for up to one week. Makes 8 ice cream sandwiches.